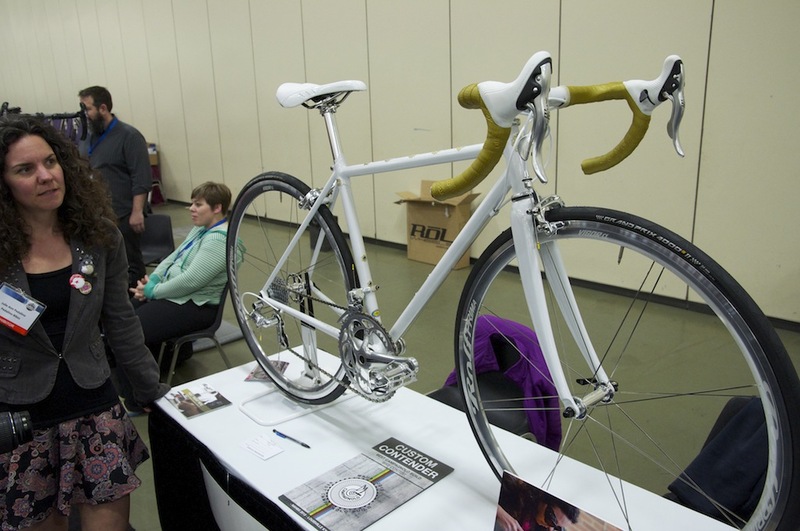 One of the smaller booths at the North American Handmade Bicycle Show contained one of the newest builders. All photos by Mitch Hull. If you ride a tandem or an old high-wheeler, you know the default comments you’re going to get on just about every ride. Thoughtless comments, really. People trying to be clever, and all failing the exact same way. Because I looked at Julie Ann Pedalino’s business card at the North American Handmade Bicycle Show and basically asked her if that was her real name. Well guess what. It was. It is. And she was really, really nice about it. Too nice, really, because you know three hundred other people probably asked her the same question. On the same day. But let’s leave my thoughtlessness aside. A clean build from head badge to rear dropouts. Julie Ann, an apprentice frame builder and mechanic at Velo+ in Lenexa, Kansas, was showing a really, really nice bike based on a fillet-brazed True Temper OX Platinum frame, complete with head tube badge and top tube accents she created with a jeweler’s saw. Fillet brazing is used to assemble steel frames without using lugs. The builder joins the tubes, then continues to feed brazing rod around the intersection, eventually forming a smoothly curved transition from one tube to the other. As in lugged construction, the builder strives to maintain the same temperature throughout the joint without overheating the tubes. However, it takes longer to complete a fillet-brazed joint, which puts a premium on one’s ability to maintain focus. 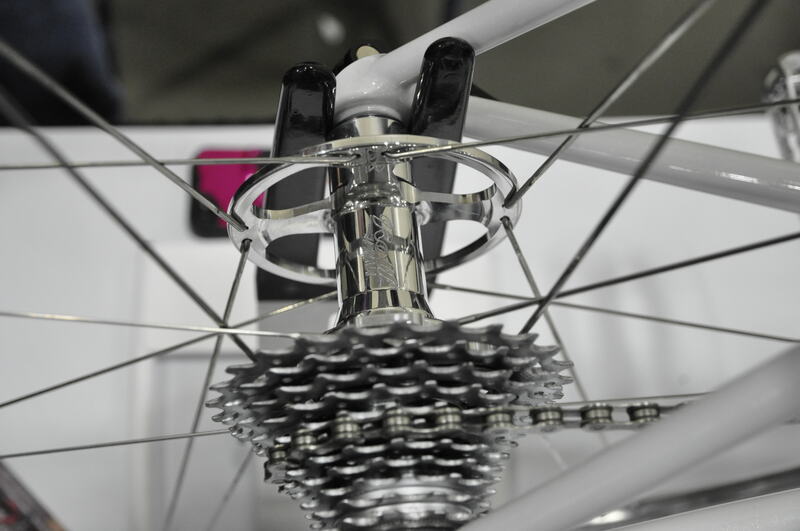 The technique comes in handy when lugs matching a frame’s dimensions aren’t available. It can also give the completed work an organic quality, as though it emerged from the steel mill as one continuous shape, not as separate tubes. I think she said this was her third frame. And while she eagerly credited her mentors at Velo+ for their guidance, all I could think was: Third frame. Fillet brazed. Pedalino. Her skill and enthusiasm for the work are obvious–just check her Facebook page. That’s why I’m looking for her name on future builds. 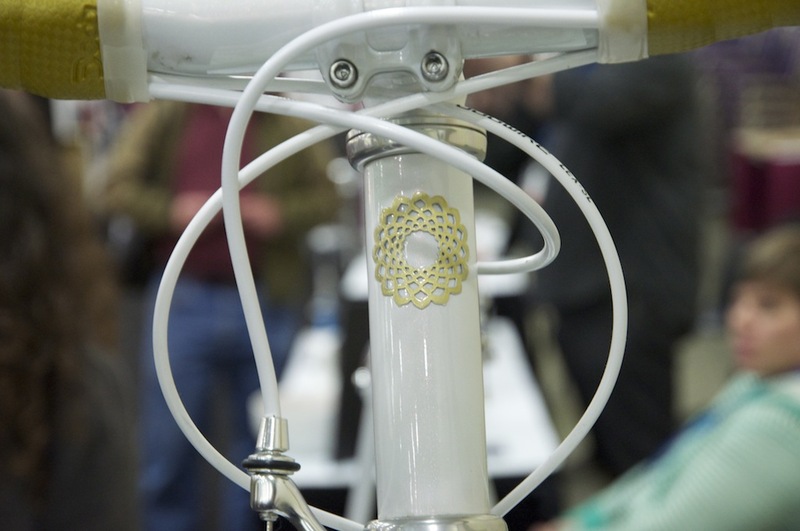 This entry was posted in Equipment, Other bicycles, People, Report from the road and tagged fillet brazing, frame building, Julie Ann Pedalino, Kansas City, Louisville, North American Handmade Bicycle Show. Bookmark the permalink. Julie is a local (to me) builder, and I started to follow her work online this past year. Quite frankly, I have always bemoaned the fact that no local builders were aligned with my own personal aesthetic, but suddenly I find that here is someone worth watching. Interesting. Very, very interesting. Getting back to her Facebook page, I like her joy of process. This is someone who invites others on her journey of discovery. Which is so cool. You guys are too kind, and this article is delightful! Molto grazie!! Keep on keeping on. You’re putting the fun into frame building. Seriously, of course.